I just wrapped up a free training call all about Facebook ads and if they really work! On the call I got into some of the myths around Facebook ads, the struggles and the wins I've had while doing Facebook ads since 2010 and why I think they are a must-have component of your online marketing plan. PLUS, I broke down the new structure in Power Editor and explained how you should now be organizing your ads. UPDATE: I announced a 24-Hour sale on the call. 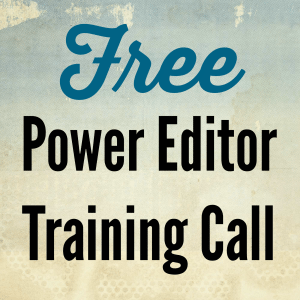 That sale has now ended, however, you can still get into the Power Editor Master Class by clicking here.